I’m not good with lack of routine. Some people thrive on spontaneity; I thrive on order and structure. Sticking with a routine for kids during your summer break can be challenging, but I’d argue that routines are still very valuable. While vacations are a wonderful, much-needed break, it can be hard to stick with things like physical exercise, not to mention spiritual exercise! Just as we are to exercise our bodies, it says in Scripture that we are to pay even closer attention to our spiritual fitness. Dig down deep and tap into your creative juices. They are there, I promise! 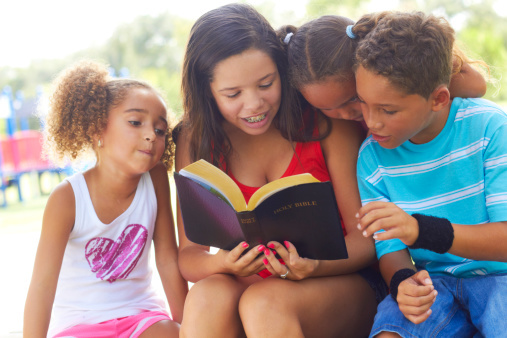 What can you do differently this summer to make spiritual learning fun and exciting? How can you make an impact for God’s glory within your own family? 2. Keep up with what is already working. In our family, we read a devotional and have prayer time before bed. Stick with something that is already set in stone, and don’t get lax on it just because it is summer break. Maintain what is working for your family. Our oldest daughter likes to read in her bed for awhile by herself before she goes to sleep. One of her favorites is the Shine Your Light Devotional by Sheila Walsh. Getting input from your children may seem like pulling teeth at times. Start asking questions that require more than a yes or no answer such as, “Why do you think that happened?” or “Why do you think God chose to create the world in just 6 days?”. 4. Create a spiritual bucket list. Go visit a local nature trail and talk about the different things God has created. Visit a local nursing home and bring some baked goods and a smile! Talk about how it is better to give than to receive. Have a picnic outside and share praises and prayer requests. Gather together some toys and items your children no longer use and drop them off at a local thrift store or to a family in need. Pick a missionary family that you support and have your children write them a letter. Posting a schedule for everyone to see is great for not only the kids to know what is expected, but to keep parents accountable for training their children in godliness and righteousness. It’s not impossible to keep a routine for kids, even while on vacation! How do you keep a family routine and still maintain the summer fun? We would love to hear what works for you in the comment section below.